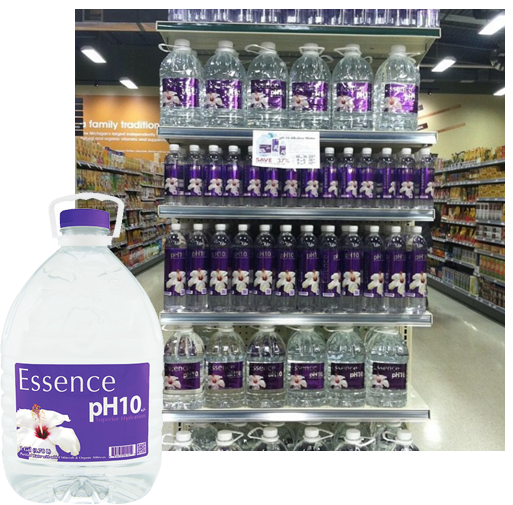 Essence pH10 is a premium water that contains the daily recommended allowance of calcium, magnesium, and zinc acetate. Additionally, we add organic hibiscus making this a nutritional water. Mr. Joel Gabriel is a professional athlete and trainer. He is very passionate about hockey and health and wellness. In order to help others, he decided to use his talents by opening a gym in 2002 called Generation Fitness. The gym was very successful teaching and training and preparing athletes for their sport. In addition, Generation Fitness stocked a full line of nutritional products. These products helped Joel’s clients improve overall well being and it was clear how important nutrition and hydration were. Joel’s clients continually asked Joel about water. Joel tried many of the options on the market but could never source the right water to serve his clients as he would have liked. Joel pondered the idea of developing a quality bottled water that was good enough for his very important clients and health conscious friends.Through years of research and review of what was currently on the market in the bottled water market, Joel finally knew he had to create a water that was truly beneficial for those who were asking for it. Joel’s search for a perfect water lead him to Dr. Sen, PHD. Through collaboration and passion to create the best water possible, together they came up with the right blend of minerals that would maintain a stable and consistent pH factor. Over the years, the team tweaked the formula and in 2013 Joel and his team improved the water one more time by adding organic hibiscus which is a high potency antioxidant. The Hibiscus addition along with new packaging to reflect the improvements increased sales by record numbers.Joel firmly believes that it is possible that Essence Water can significantly improve the quality of life for all people.Gabriel currently resides in Los Angeles, CA with his dog Jax, who is the mascot for Purity Plus Pet Water. Joel kayaks, paddle boards and works out at the beach serving his friends Essence Water while soaking up the good life. Dr. Arup Sen, Co-founder and CEO, is an experienced biotechnology executive with more than 30 years of experience in starting, growing (including through mergers, acquisitions and public offering) and establishing strategic alliances with multi-national companies (for licensing, joint ventures, equity investment). Dr. Sen served as the President and Chief Scientific Officer of GenoMechanix, LLC, a biotechnology service company in Gainesville, Florida, that he founded. Dr. Sen completed his Ph.D. degree in Biochemistry from Princeton University in 1974 and subsequently held staff and faculty positions at National Institutes of Health and the Scripps Research Institute in California. Dr. Sen has held executive management positions in biotechnology and pharmaceutical companies since 1982. He is an inventor in several U.S. and foreign patents as well as more than 50 pending patent applications worldwide. Dr. Sen has served as the president of Sustainable AgroBiotech, LLC., a company in the business of commercializing technologies for integrated biorefineries that capitalizes on proprietary technologies for carbon dioxide emission capture and its conversion to microalgae to produce biofuels and other high value bioproducts.Dr. Arup Sen from Solutions Technology Inc, is in collaboration with Essence Water, Inc. In addition to being a successful entrepreneur, Michael has over 35 years of experience developing national distribution networks and sales organization teams domestically and internationally. He is an expert in the consumer packaged goods industry with an emphasis in the food and beverage markets. Mike has had tremendous success increasing sales and distribution for many well-established products and has also had great success in launching new small emerging brands. Mike played an instrumental role in the expansion of a sport nutritional line, increasing the company valuation from 0 to 50 million dollars in less than 4 years. As the Corporate Vice President of Brokerage Operations for Tree of Life, he managed over $375 million in annual sales, oversaw operations for 5 Division Vice Presidents who themselves managed 122 employees. Mike was instrumental in obtaining distribution worldwide for AquaHydrate, a new brand of water owned and operated under the direction of Mark Walberg and P Diddy. Michael is currently working with Deepak Chopra on his Stress relief drinks and will oversee product distribution efforts worldwide. Mike has been influential in developing and maintaining key relationships with buyers across all channels of trade including the Natural Food Stores, Military Resale system, C-store, Mass Market and Drug. Sheryl Lynn has put on events of all sizes from networking luncheons to savvy red-carpet events. She has coordinated fun and profitable workshops, product demonstrations, panel interviews for large audiences, radio shows and webinars. Her career has been to empower the small business owner and to promote them so that they can gain the much deserved visibility and recognition. As Event Coordinator for many of her clients, Sheryl was responsible for all the training, sales, reorders and merchandising and all aspects of developing a strong sales team. Her departments rose to the top 3% of the companies overall sales. Sheryl has demonstrated excellent leadership skills in the natural food business by calling on convenience stores, natural health food chains such as Whole Foods, CVS and Jewels. Sheryl moves people and projects forward with immense enthusiasm and follow through.